The first thing that struck me was how nice the bottle is, I know it's only a bottle of bubble bath, but it's certainly a very nice bottle of bubble bath. 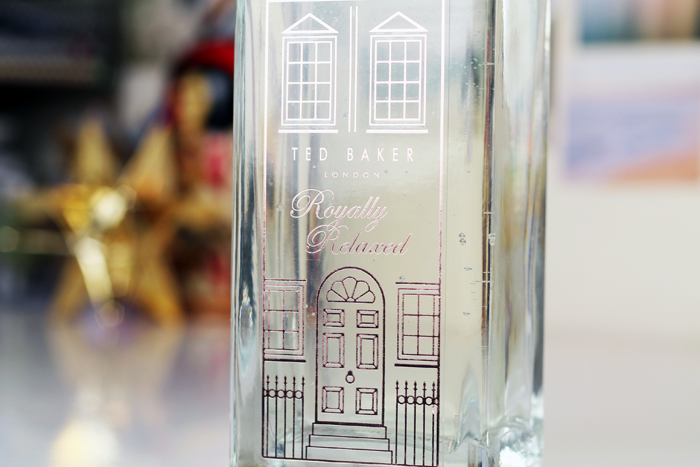 It's a weighty glass bottle with a very sweet, simple house illustration on the front and a rose gold lid embossed with Ted Baker's initials. The house illustration is only a sticker, but it still looks very cute. There's also a really good stopper in the top, ensuring that too much product doesn't run out uncontrollably. A good glug gives lots of thick, white bubbles that don't disappear instantly and a delicate, somewhat unusual floral scent. I was expecting it to give quite an intense rose scent for some reason, but it's actually much more subtle and relaxing. There's 500ml in there and I don't know exactly how many, but I think it will provide a heck of a lot of bubble baths. Lovely! Well done Ted Baker, I'm very impressed again. What gorgeous packaging! This would look so stylish sitting beside the bath. Wow I really want this. It sounds amazing, I'd be so happy with this as a gift! This sounds incredibly, not to mention how stunning the bottle is! ooh I love the packaging! Woah, I thought this was a perfume at first! The bottle is gorgeous. This would make a wonderful gift. What? Ted Baker as a bubble bath? AND it looks like a doll's house?! That's such a beautiful bottle, and actually in my price range... tempting!